Alexander Cartwright, vice president for research and economic development at the University at Buffalo, speaks during a conference Thursday about the new Buffalo Niagara Advanced Manufacturing Institute to be opened on the Buffalo Niagara Medical Campus. A new center aimed at promoting the growth of area manufacturers will ramp up to speed this year. The Buffalo Niagara Advanced Manufacturing Institute, which is a piece of Gov. Andrew M. Cuomo’s Buffalo Billion initiative, will open in stages, starting with some operations this summer, said Howard Zemsky, co-chairman of the Western New York Regional Economic Development Council. The institute will be housed at 847 Main St. in Buffalo, in the former SmartPill building. The Buffalo Niagara Medical Campus bought the building with an $8 million grant from Empire State Development. Zemsky said the institute is expected to be housed there for probably at least the first five years of its existence. The center will be operated by EWI, an Ohio-based nonprofit engineering services research and development company. Plans call for the state to pour $45 million of Buffalo Billion funds into the center for machinery, equipment and future facility needs and operations. The University at Buffalo will be a partner with EWI on the institute. Spurring growth of advanced manufacturing is a priority of the regional economic development council, which has identified sectors it believes the region is best suited to capitalize on for job growth. The Buffalo Niagara region’s manufacturing job count has plunged over the decades, but the sector’s employment has stabilized in recent years. Zemsky said manufacturing already plays a big role in the region’s economy, to the tune of 50,000 jobs, $5 billion in gross regional product and more than 2,000 small- to medium-sized companies. Backers of the center see it as a place where companies can tap into resources to test and develop technologies and improve their processes. It is aimed primarily at smaller companies that could not afford such resources on their own. EWI “has proven to be effective in growing the manufacturing economy as they did in their part of Ohio,” Zemsky said. Local officials have been working with EWI for about a year to lay the groundwork for the institute, he said. Henry Cialone, president and chief executive officer of EWI, said the institute will concentrate on four areas: flexible automation and controls, advanced materials and testing, additive manufacturing and advanced manufacturing. About half of the facility will consist of laboratories. The rest will be for meeting rooms and office space. Among the founding members of the institute are Praxair, Sherex Fastening Solutions, the InVentures Group and Jiffy-Tite. Keith Blakely, chairman of the InVentures Group, which works with innovative companies, said the institute will ideally become a hub of cutting-edge work. 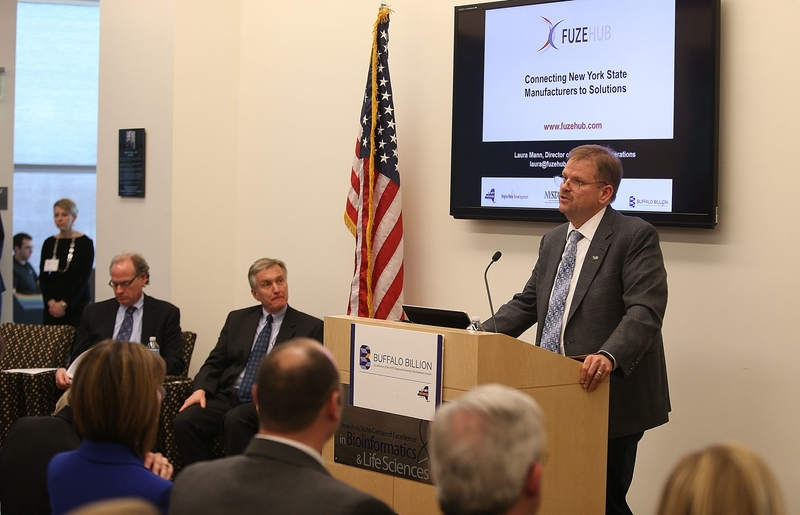 “When you look at where electronics, or where biomedical devices, or where surgical processes are going to be five years from now, we want this institute to be working on those materials, those devices, those products and those processes, simulation, all of that, so that Buffalo and Western New York have players in the form of commercial companies that are taking advantage and leading the way,” he said. EWI expects to employ about 30 to 35 employees at the institute within five years, Cialone said. It will gradually staff up this year, including hiring an executive director. The institute for its first five years will be supported with an allocation from the state. In some cases, it might be a group of companies that are working on a common issue. Some revenues will be generated from membership dues, similar to a model it uses in Ohio, he said. The institute’s target is to generate more than $6 million in annual revenues by year five and create or retain 841 manufacturing jobs in the region in that same span.